The Ultrafast Flyknit is the newest, lightest and fastest training shoe in the Brands arsenal. Designed for speed, support, versatility and lightening fast movement, it combines form and function to great effect. On first impression the Nike Train Ultrafast Flyknit is unique and stylish. But how does it perform in the Box when the heat is on and every seconds counts? The Ultrafast Flyknit shoe will allow you to move quickly and generate speed easily. This is especially useful for sharp transitions between Exercises. The Icelandic powerhouse Sara Sigmundsdottir is a great example of a Crossfit athlete who puts thought into her transitions. 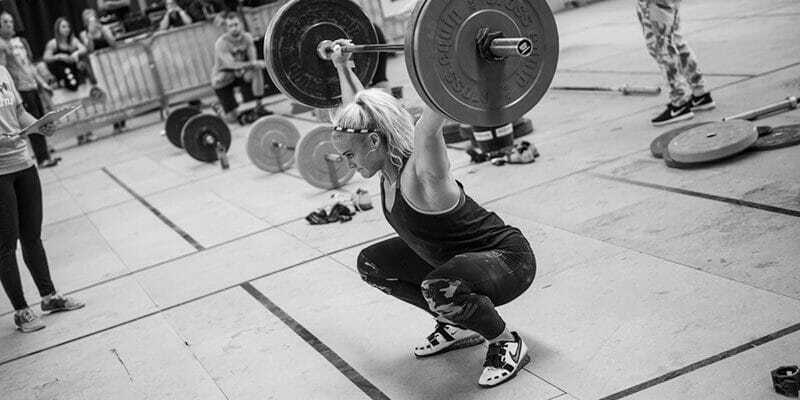 Mistakes in the past have cost her places and lost her points in major competitions, and she has tightened up her ability to move quickly and effectively from one exercise to another during WODs. Make sure you do the same. 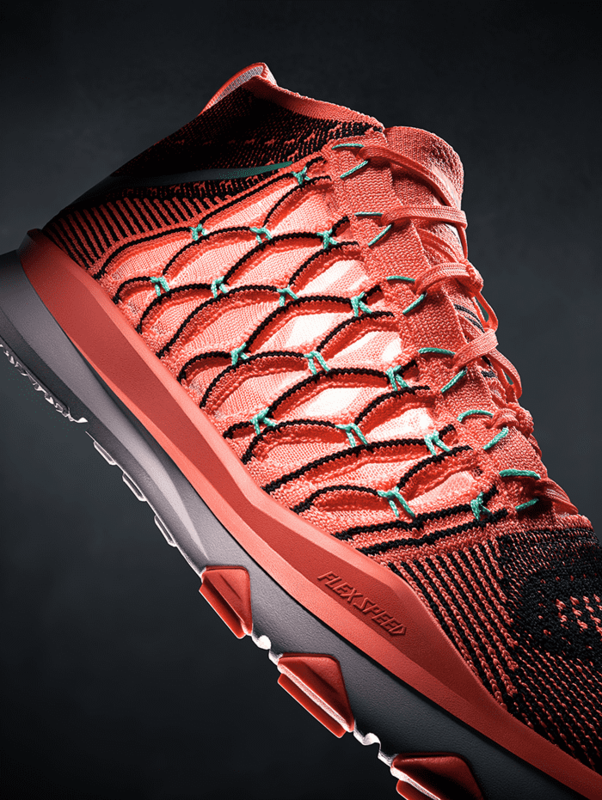 The diamond shaped Flyknit upper is lightweight, breathable and linked together in a chain-link system. 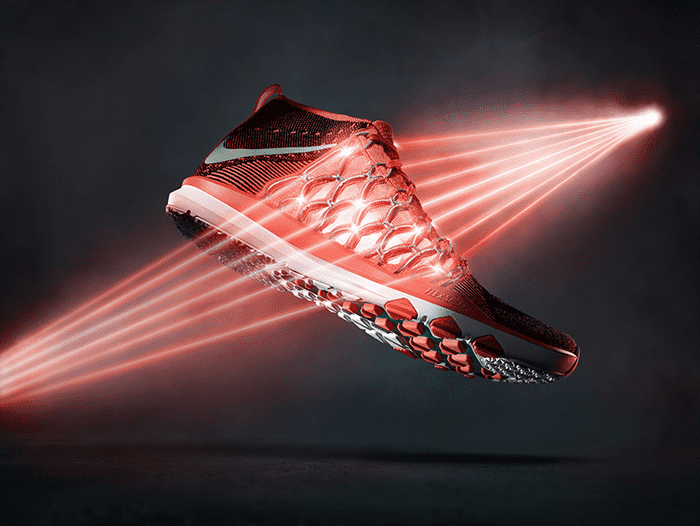 Nike flywire is woven through the Flyknit cables and functions like a Chinese finger trap toy, locking your feet in position yet giving them the potential to move quickly. The sole is low and stable, making it effective for lifting movements. These aren’t the shoes for launching into your 1RM Clean and Jerk, but then the Nike Romaleos 2 weightlifting shoe is designed exactly for that purpose. Think more along the lines of thrusters or lower weight, high repetition lifts, for which the stable platform that the Ultrafast Flyknit offers is perfect. 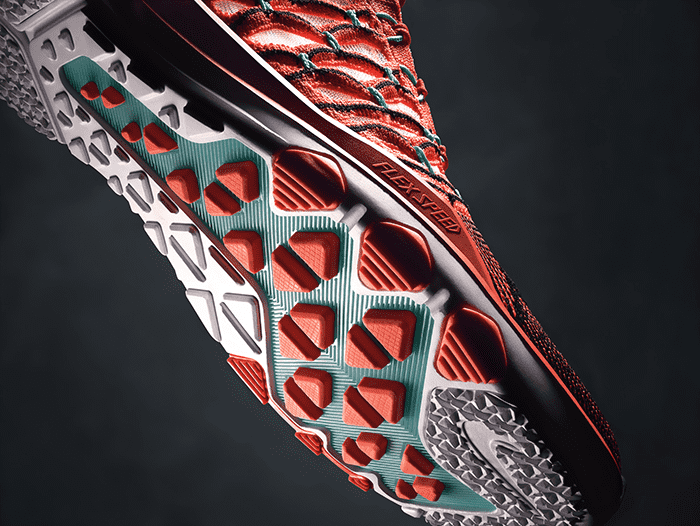 The Flex Speed plate underfoot has diamond shapes cut out of the plate in order to push the cushioning through, which helps to create propulsion and power for speed training. This technology is perfect for movements such as bar facing Burpees, or Box Jumps that require quick, explosive movements in alternating directions. Additionally because they are so light, over high repetition sets this makes everything much more efficient and will preserve your energy. The Ultrafast Flyknit has a 1.5 cm high collar to offer a sock like fit that hugs the foot and supports the ankle. This adds a confident feeling of stability throughout each lift and exercise. While the uppers support rapid lateral changes of direction, the outsole is flexible and cushioned for maximum running comfort. Combined with the overall lightweight design, this combination creates a shoe that is well designed for running. The breathable upper helps to keep your feet cool, so it is especially well suited for the warm summer months when you may take things outside onto the track as well. The combination of bold, minimal blocks of smooth colour with the textured, web like knitted upper creates a distinctive and noticeable style. The ankle high cuff makes for a unique silhouette, and the blood orange, black and deep turquoise colourway is finished well with the addition of a clean white sole. Nike have a great history of delivering many style classics when it comes to footwear, but these balance many complex stylistic and functional elements into a unified, distinguished training shoe. There is no doubt that these training shoes stand out, and will make you noticed as you smash your way through your WODs! HOW DO THEY COMPARE WITH OTHER NIKE HIGH INTENSITY TRAINING SHOES? With the Nike Metcons, now in their 2nd edition, you have a slightly sturdier shoe. 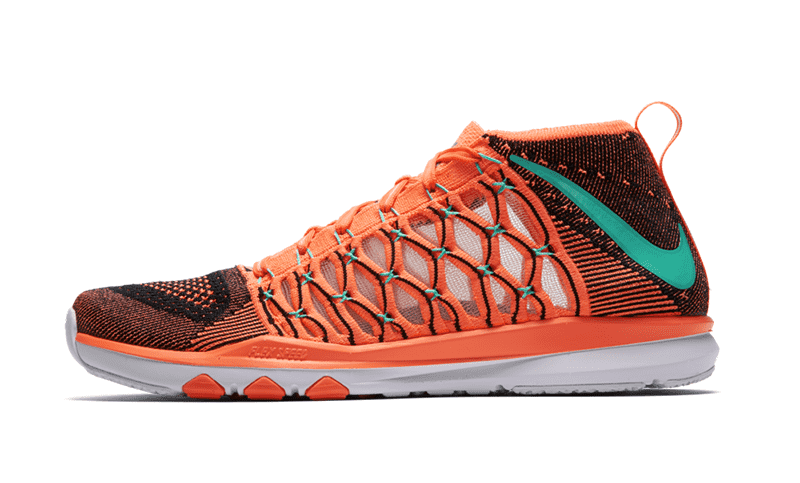 The Metcons also have a higher triangular sole in the middle of the arch that helps grip during rope climbs, but The Ultrafast Flyknits are built for speed and responsiveness, and so they are quicker in these respects. The Nike Romaleos are built specifically for weightlifting, so in comparison to the Ultrafast Flyknits you have two different animals on either end of the functional training spectrum. Both are highly effective for the jobs that they are built for. 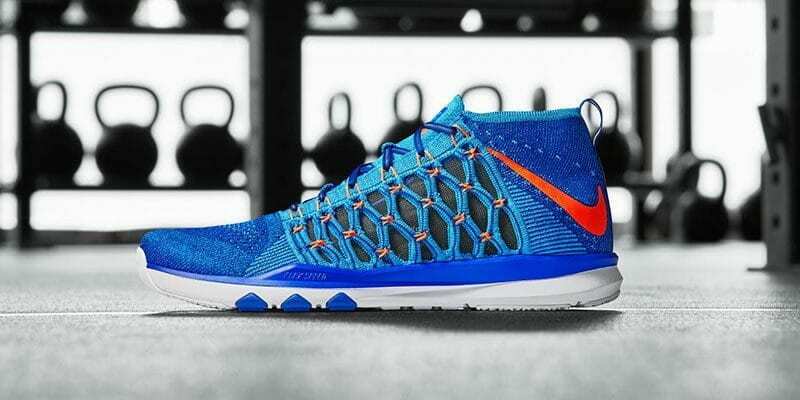 The Nike Train Ultrafast Flyknit are designed to run, jump, cut and lift with speed and precision. With a sole that is low and sturdy enough to lift with power, yet cushioned enough for running and an upper that supports quick, lateral changes of direction and responsive support, you have a training shoe that enhances performance both in the Box and out on the track. Nike have also redesigned their Training Club App and upgraded many of its features to help increase the quality and effectiveness of your training. Choose from over a hundred strength, conditioning, mobility and endurance workouts, as well as others such as boxing or yoga. Variety is so important to functional fitness so mix it up and keep your body guessing in order to avoid plateaus or boredom. Destroy your WODs in style! The plan will constantly adapt to keep you working hard and stop you hitting plateaus or losing interest if things get too easy. With the updated NTC app, it will include and take into account extra exercise as well. If you went for a hike at the weekend, played 5-a-side football with your mates in the evening or started the day with a swim in the pool for your active recovery work, then the NTC app will track these into your fitness routine and program accordingly. Because who doesn’t love a bit of competition right? If you know that having a friendly rival or two helps to push you to become a better athlete, then you can share your workouts with your friends. Post your latest PR, customise with NTC stickers and find inspiration from other athletes in the NTC app. Since the Nike Train Ultrafast Flyknit is not in stock anymore, take a look at the brand new Nike Flyknit training shoes.